Come and try scuba diving with us! It's your chance to discover greatest dive sites in Maldives around Thoddoo, Rasdhoo and Ukulhas islands. Diving is much easier and more fun than you might think! Why not combine your diving adventure with some diving training? While diving with dolphins, sharks, stingreys, grab some extra certifications. We offer PADI, CMAS, IANTD courses up to Instructor's levels. Maldives is the world diving destination #1. Maldives has everything to prove it: clear warm water all year around, perfect visibility (20-40 m), and fantastic marine life. Corals, sponges, nudibranchs, fish, stingrays, dolphins, mantas, sharks - you name it. Diving in Maldives has some cool features. Most famous one is currents. Sometimes mild, sometimes strong, but always enjoyable. Jump in, adjust your buoyancy, and... just relax. Move with the waters along the reef walls (faru in Dhivehi), enjoy spectacular views of sea inhabitants, breath in, breath out. Napoleon wrasse, parrot fish, trigger fish, angel fish, snappers, groupers, sweetlips will be your companions in the journey. Mantas and reef sharks patrolling their areas or arriving to cleaning stations are often seen too. In Thoddoo, there are some nice walls up to 30-40 meters deep. 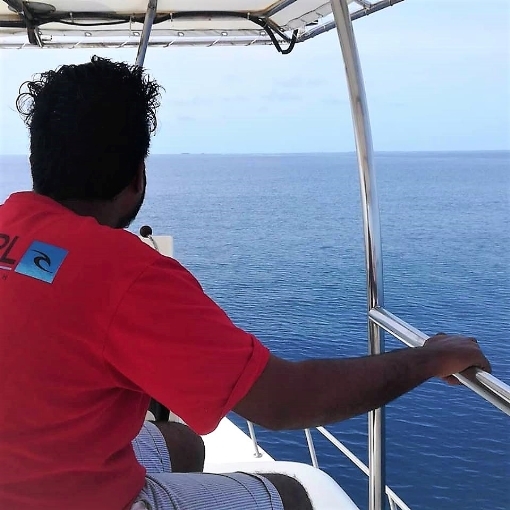 Diving in channels (kandu in Dhivehi) between atolls and islands in Maldives sometimes can be challenging due to strong currents and visibility but always awesome because of greater chance to encounter sharks and mantas and better coral life. Madivaru channel near Rasdhoo island is the place to see hammerhead sharks. North channel (north to Veligandu resort) is where you can see mantas almost every day. There are some underwater rocks growing almost up to the surface called 'thilas'. These formations are like stop signs for the currents, providing food for corals and sponges - favourite food of bigger fish, turtles and sharks. Best thilas are located near Ukulhas island (Maaya Thila, Maa thila). What about cavern diving, wreck diving, night diving? Yes, yes, and yes. You can have it all. Please contact us info@maldivesdives.com for detailed itinerary. We'll be happy to assist you planning your stayand diving in Thoddoo, Rasdhoo, Ukulhas. Despite common belief, summer is a very pleasant season. The first half of July was good: it's been sunny with some rains afternoon. However, frequent rains and fresh winds during the second half of the months didn't impress our guests much. So August is to take the re-match. Its been already 2 weeks of perfect weather by now. The seas are flat, currents are mild, and visibility is good. Forecasts show another week of wow-type weather, so if you happen to come to Thoddoo in August, great tan & diving fun are guaranteed!